Steven and I chose Roodewal as a wedding venue because of its relative proximity to Letaba, but also because we could book out the whole camp and have our private wedding function right there: In the middle of the bush and Kruger National Park: the place where we met and fell in love. I was still working for KLM then and together with my mom, stepdad, my brother and sister in law, we made the long flight and drive to Kruger for the wedding. It was not going to be anything fancy. No three-tiered wedding cake, or elaborate flower arrangements and centerpieces. Just our immediate family and a few close friends, some simple decorations and a braai. But featuring our beloved Kruger National Park as the center of attention. And we were completely fine with that. Although there were some family members and good friends we would have loved to be there and unfortunately could not invite. But Roodewal only sleeps 18 and that is it. Small and intimate it was. Apart from our 16 wedding guests, we had a few ‘uninvited guests’ though. A squirrel had occupied the bedroom Steven and I were sharing with my brother and sister in law the night before the wedding. We pushed all the beds together in the big bedroom like a giant Christmas bed. And as we were settling in for the night after a very nice braai, all of a sudden a squirrel appeared from under the covers. It ran up and down all four beds before eventually disappearing between the beds. Steven had us all in stitches diving between the beds, trying to catch this slippery squirrel. Dressed in nothing but his underpants he was bobbing all over like a spring, in his attempts to catch the squirrel that, by the sounds of it, was not amused that it had to share its comfortable bed with four humans. Steven eventually caught it in a towel and carefully escorted it off the premises. Thank you, Steve! I needed my beauty sleep the night before our big day. With my stepfather guarding the decorations, I could focus on getting ready for the ceremony. Stevens parents had brought a generator so I could do my hair (there is a little bit of solar power at Roodewal, but not enough for blow dryers and goodies like that) and my sister in law did my make-up and she and my lovely mom helped me put on my dress. As the sun was slowly setting over the Timbavati, everyone gathered on the wooden deck. I could not have asked for more. My family was there, so was Steven’s, and some of my best friends were also there to witness our special moment. I found it a bit hard to focus on all that the pastor was saying… Not only were we getting extremely hot in the direct sun, but on our right a few elephants were also moving in the dense vegetation on the opposite side of the bank. In the distance, a fish eagle was calling. It was the perfect setting. I said I do, so did Steven, there were tears, laughter and more tears of joy. Steven’s very talented brother and sister in law did our wedding photos for us after the ceremony. While the rest of the wedding party were enjoying a glass of sparkling wine on the deck overlooking the Timbavati, we went into the bush for a little photo shoot. Steven’s supervisor had graciously lent him the trail’s Landcruiser and both the cruiser and Steven’s rifle feature in most of our wedding photos. It is just a shame there were no elephants or other game around. That would have completed a perfect day. Cruiser, rifle, my fav wedding pic! I so loved reading this. Thanks for sharing these wonderful memories. How awesome and memorable. Congratulations. What a fabulous beginning to your awesome married life. Loooove the pink heels. Depicts your independent spirit perfectly. Thanks for sharing. Congratulations !!! What an amazing wedding !! Congratulations Linda and Steven! May your married life be blessed throughout your living years to come. The pictures of your wedding are beautiful. Enjoy your wonderful life in the bush! Congratulations to you dear! What a lovely idea hey! What jobs can a person get in Krügerpark? I would love to do something! in a few years i am on pension and fit as a fiddle as i feal like 30 and am still adventurous and love animals. Ook vanuit Nederland de felicitaties met jullie 5-jarig huwelijk. Van harte gefeliciteerd met jullie huwelijks herdenking. Wat een voorrecht om daar te mogen wonen en werken. Wij wonen in Pretoria en zijn wild van het Kruger Park. Ik geniet terdege van jou avonturen. Groeten Marion. HAPPY ANNIVERSARY LINDA AND STEVEN. Thanks for sharing your wonderful memories with us – I really enjoyed your blog – the photos are stunning. God Bless you two and your little family in the coming years in Kruger Park. What a beautiful place to seal the deal! 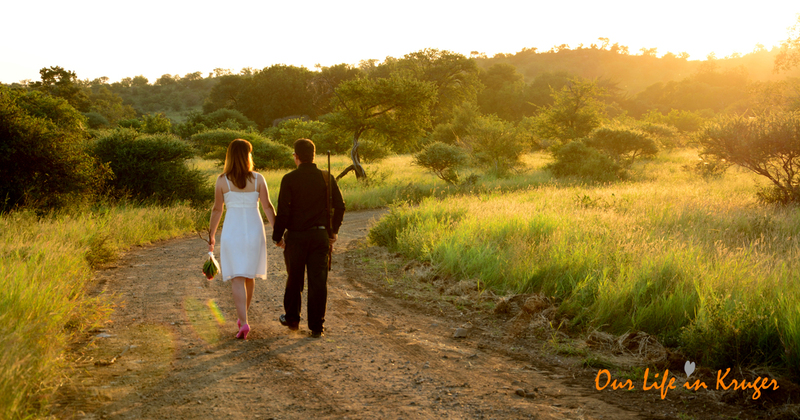 You are such a stunning couple, and your wedding pictures are amazing with the gorgeous Kruger background. The monkeys will think twice next time! Thanks for sharing your wedding with us. Happy Anniversary! Hartelijke felicitaties met jullie 5 jarig huwelijksjubileum, geniet ervan! So beautiful! Happy anniversary tomorrow!! Thank you for sharing your story! Congratulations on your 5th wedding anniversary special couple. May you be blessed with many more happy years. Congratulations and many more happy years together preferably in that special place you call home! That must have been a dream wedding in the bush. Our company had a house there some years ago but I didn’t have an opportunity to stay there. I must visit during our trip to Kruger in July/August. Thanks for sharing your wedding story! Wow what a romantic start to your beautiful life together. Happy Anniversary and thank you for sharing your wedding story. Wishing you many many more happy years together. Wat ‘n pragtige storie. Baie geluk met jul huweliksherdenking en vele meer toegewens!